Chronic fatigue (CF) is a cruel beast I face off with each day. Some days I win. Most days the fatigue succeeds in siphoning away any energy I woke with and I want to crash. To those of you who have experienced chronic fatigue this note doesn't shed any new light on the relief of symptoms. I have tried everything the doctors and my friends have recommended and ended up with no significant relief. Maybe you are not saddled with chronic fatigue. If so, rejoice and let us all hope your good fortune continues. Not sure you're experiencing CF? Don't worry. Once you've experienced CF you will know you've been there. No doubt. Chronic fatigue is not the normal ups and downs associated with everyday life nor does CF go away with rest. CF manifests itself in my life with many of the same apparent symptoms as depression. Some days others assume I am depressed or 'down in the dumps' because of delayed responses to questions or lethargic appearance. Coffee sometimes helps me for about three or four minutes. Other times the java won't even begin to help with the apathy. Last week I rode to Sarasota with two others, the first lengthy long road trip since my dissection surgery. We left early and the van was quite comfortable. However once we reached our destination around mid-day I was so exhausted that I sat down on the concrete pad we were gathered on, leaned back against a post and closed my eyes, ready to pass out. One of my traveling companions who knew about my health issues walked over and took me back to the van. I had been overwhelmed with a desire to lie down and let the exhaustion envelop me like fog on a wet, humid morning. I wanted to give in to the CF beast and let it devour me. I did not care about anything but closing my eyes and sinking into the mental and physical fog. On the trip back my memory issues manifested themselves as they do occasionally and I could not remember names. Two or three days follow up rest were needed to recover from a simple road trip. Doctors say exercise can improve circulation and stamina and help prevent CF. And for sure I try to exercise. Walking, swimming and stretching keep my heart in 'crawl forward' mode and out of park or reverse. I think the mixture of beta-blockers (Metoprolol), blood pressure medicine (Losartan), Coumadin and other medications may be partially responsible for my chronic fatigue. Because my descending aorta is dissected from the ascending Dacron graft down into my legs, the doctors keep my pulse below fifty beats per minute. A slower heart beat means less oxygen available to muscles, organs and my brain. Additionally, my heart output function has been calculated to be around twenty or twenty five percent according to my cardiologist. Trauma from multiple surgeries, new valves and synthetic aorta material make my heart's job exponentially more difficult. Interestingly, though existing literature on the topic is insubstantial, I have found that as my PT-INR rises significantly higher than normal, my fatigue also increases exponentially. Though the medical profession has not definitely determined specific causes responsible for CF, chronic fatigue is real and debilitating. Many of those challenged by Marfan Syndrome and other connective tissue disorders must not only adapt to weakened muscles and joints, scoliosis, leaky heart valves and aneuryzed cardiovascular tissue but also cope with continued depletion and exhaustion. CF has opened my eyes to better understand what a zombie's life is really like. Though I believe chronic fatigue is not the same as depression, I do consider CF to be a primary cause of situational depression. I fight the CF beast every day. Though it would be so easy to give in, close the blinds, turn down the thermostat a couple degrees, crawl under a quilt and go to sleep, I am not willing to surrender yet. I will not willingly become a zombie. When my son asks if I will go to the skateboard park with him I go. When my daughter says, 'Dad, let's go to the grocery store to buy a gallon of milk' I ride with her. When my wife asks if I will go to the beach with her, I go, even with the CF beast hanging on my back, beating on my head and biting my neck. My battle plan is simple. I'm first going to learn what circumstances invite a CF attack. Journalling about daily activities is the best way to establish CF patterns and trends. I know I must continue to exercise. However when I stand to walk outside and my ankle feels as though it is falling apart, the pain invites fatigue and fatigue then invites lethargy. Even so I make myself walk or swim, even if it is only for a very short duration. Healthy foods are important too and this is an area where I am diligently journalling and researching in an attempt to find food patterns and their respective relationships with chronic fatigue and connective tissue issues. Potassium, phosphorous, saturated fats and certainly sugars all have shown themselves to be somehow related to my CF incidents. Understanding the CF beast will be a journey across time and one without a clearly defined destination. Rest is not the answer. Though daily rests provide respite for my mind, most naps I take produce additional physical fatigue. I usually wake up so much more tired than when I was before I went to sleep. Cutting back on medications is not an answer either. Beta-blockers and blood pressure medications keep me alive. I have changed medications before and this route has not provided real CF relief. Exercise and diet may hold promise. As I learn from food patterns I will update the post here. In the meantime, I am not giving in to the CF beast. I am not going to become a zombie. I am going to beat the beastie fiend as soon as I find the energy to do so, or locate some vitameatavegamin. One thirty am and no sleep in sight. Overhead the ceiling fan slowly whirls and I get up to pull the speed chain. Spinning blades whistle a little louder and the rocking back and forth of the fan's base against the sheet rock is an annoyance I came blame sleeplessness on. The State of Florida is killing me softly, with their unending, unrelenting songs of desire. They want more and more and more. And with the leisurely bright blue digital numbers staring unconcerned from behind the alarm clock's plastic faceplate, Florida's government is accomplishing what my torn aorta could not. I never expected being disabled to be easy, but maybe I hoped life would become manageable. Being a person with disabilities has a full slate of new and additional challenges and challengers, not the least for me being the State of Florida. You'd think the state would want to help make getting through the daily challenges more basic, effortless. But that is not the way it works, at least in my present experience with the driver license bureaucrats. I've been a good driver over the past many years. I am even a better driver today because of my surgeries. Today the second letter arrived from the Department of Motor Vehicles (DMV). Today's DMV letter is the reason I am staring at the ceiling fan instead of dreaming. The first letter arrived about two months ago (visible via Google Drive here), signed by a Hearing Officer with the Bureau of Administrative Reviews requesting my presence in their Daytona Beach office to discuss 'your ability to safely operate a motor vehicle'. I suspect the title, 'Hearing Officer', is an attempt to satisfy due process requirements. Life for all the disabled is hard enough already. For me there are quite a few medications to buy, organize, record, take and then coordinate refills with the many different prescribing physicians. There are frequent PT-INR and other blood tests, iterated blood pressure and pulse readings, prescribed exercise and therapy now and also the task of trying to self diagnose the strange and somewhat disconcerting new pains that occur daily. Going to the doctor or ER for each unexplained serious symptom is simply too difficult logistically. Coordinating with insurance and the various doctor's office billing companies is a full time job in itself. Though taken individually some of this may sound easy, cumulatively the load can be overwhelming, especially for someone who has a hard time somedays walking out to the mailbox. My primary care physician says 'your job is to stay alive'. And so we've simplified, trying to keep stress levels to a minimum. Yes, the beta-blockers like Metoprolol help, but only to an extent. And I really stressed out thinking the State of Florida would take my driver's license after the first letter arrived. The day of the scheduled appointment arrived and I sat down with the Hearing Officer who asked me (and recorded) a list of questions about my condition and my medications. I provided her with the completed medication chart as requested by the State of Florida. She also spoke with the other driver who accompanied me about their perception of my ability to drive safely. Ironically, there are some people out there right now who can not clearly see three feet in front of them with driver's licenses. They are the ones the State of Florida should be after. The Hearing Officer had me sign a medical release form and collected contact information for my cardiologist. She informed me the DMV would contact my doctor and once the medical review committee met to consider the information a decision about my license could be rendered. My cardiologist called me to confirm receipt of the form and tell he would submit the required information to the state. I made the mistake of thinking the whole exercise was done, complete and history. Wrong. Today another letter arrived in the mailbox from the State of Florida (check it out here). This letter contained a much more detailed medical inquiry form. My cardiologist had told me point blank he supported my driving and made clear his opinions in the form the State of Florida previously required. The new form was to be completed by a 'personal physician', one I am assuming to be my primary care doctor. 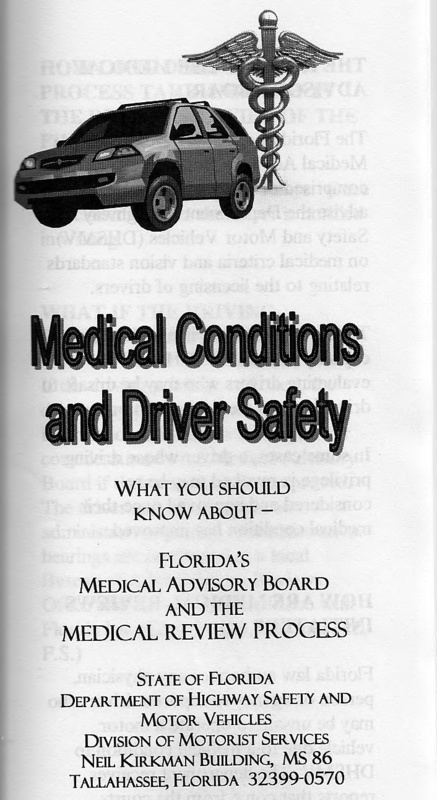 The letter was also accompanied by an informational brochure explaining why someone might be 'red-flagged' as an unsafe driver because of medical conditions. But as the ceiling fan whirled overhead between one and two am this morning, the new form questions reverberated back and forth through my head. The State of Florida is killing me softly as I lay here with adrenalin hitting my heart despite Metoprolol. Why does Florida want my personal physician to state my education level? Why does Florida want my personal doctor to tell them if I am have been declared disabled? In my opinion the form is extremely confusing and serves only to duplicate the essential information already submitted on my behalf. Life for the disabled is hard enough already. This new form going to be time consuming to complete - I'll have to try to schedule a checkup appointment, explain the circumstances behind the forms, make sure my primary physician office coordinates all records with my neurologist, ophthalmologist, cardiologist, nephrologist and others, complete the forms and submit back to the state within the 45 day limit. Most other aspects of my life will go on hold now for a couple months, after which the real waiting starts. I am sure phase one will lead to phase two, for as here it always does. And time is not the only issue with being caught in the bureaucratic system of forms and computerized phone answering systems. I can ill afford to spend the significant amount of money these unplanned doctor's visits will end up costing. 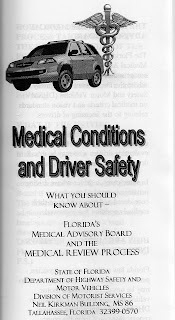 Anyone can report another for suspected unsafe driving circumstances here in Florida. However, I am not sure how I ended up being red-flagged. My license says 'Safe Driver' and although my short term memory sometimes lacks, the reason I can't remember my last ticket is that my last ticket was well over fifteen years ago. Since speculation leads to stress, I am not going to worry how I ended up being red-flagged in the system as a potentially unsafe driver who needs to be medically examined over and over to keep his license. As I've said here before, my heart functions about twenty to twenty five percent of capacity and I deal daily with the implications of a connective tissue disorder and an aorta that is still torn from the top of my heart, down through my abdomen into my leg. Life for the disabled is hard enough already. I think anyone who has struggled with long-term, chronic disabilities may agree. Life is hard enough without government making life more complicated for the disabled. In the meantime, the State of Florida is still killing me softly, regardless of how hypnotically the ceiling fan overhead whirls. Writing this post about depression has shaken most every core belief in positive thinking I've held and drastically changed my expectant outlook on life. First let me unequivocally make clear I am not a medical professional and have no qualifications to write about depression and Marfan Syndrome other than from the perspective of someone with Marfan Syndrome who has experienced significant depression lately. From the time I began thinking about writing a note on feeling down because of chronic pain associated with Marfan Syndrome and connective tissue disorders (CTDs), a disturbing darkness kept me away from the computer keyboard each and every time I was compelled to write. I even closed my Facebook account for a week, wanting to hide from all my family, friends, the world and the God who I wondered about, daily asking myself "why, if God was so good, would God not take away pain, depression and suffering?" My sullenness and dark withdrawal were perplexing symptoms for me to comprehend as I am someone who usually exhibits an upbeat, "it will all be OK", outlook on life. How many times have we heard "our lives are products of those thoughts we harbor"? Our words, especially with respect to health and wealth, are supposed to reflect our actual circumstances. Yet in my Marfan Syndrome framed life vocally claiming health and wealth principles never really proved to have a real payoff. Some said my faith was not strong enough. Some said my God must not be the God they knew, my unfulfilled expectations a reflection of personal failure. But I tried to put on a happy face and keep a can-do attitude. In reality my upbeat attitude for years was mostly buoyed through wildflower photography, hiking (when I felt up to a walk) and music. I so love music, all kinds of music! Being near the ocean helped too. Working with Judy work in her garden made me happy too, before the big dissection. In the aftermath of my multiple open heart surgeries and the onset of a host of other connective tissue disorders, my upbeat attitude started rapidly changing to more of a downbeat persona. For a time I tried to stay positive, focusing on my wildflower photography and hiking along the seashore. But the petals, stems and stamen are not a healing God and neither was the ocean. As spring turned to summer the beauty of our Black Eyed Susans and most other wildflowers shriveled to a dried up brown. Seasonal tropical storms washed up endless stretches of trash across the beach. My nature based emotional crutches were temporal. Nature's beauty, music, prayer and exercise were all great tools for keeping my spirit lifted but they were only temporary in nature. I needed a permanent fix to my deep melancholy. Pretending only goes so far and chronic degenerative diseases are not imaginary. Realization my answers to gloom did not lie in photography, walks, distractions, expectations, faith or hope was disheartening. I did not look sick and this made things worse. People would look at me when I parked in a disabled spot in a way I shamefully perceived as someone taking advantage of crippled elderly folk by stealing their handy parking spot. I wanted to shout out that my heart functions at twenty five percent capacity on a good day and when I try to do something with my teenage son like handball, I walk across the court relying on strategy rather than athleticism (and still get beat). Parking close is important if I have to carry any weight out of the store. The weight of a watermelon could fully aneuryse my existing dissected descending aorta. I am not going to get better without additional major arterial surgery. Unfortunately and discouragingly, the doctors have talked along the lines of the required surgery being 'too risky'. Then there was the lady who tried to be encouraging by saying something like 'getting a job would be good for you because I know you really want to support your family'. I wanted to tell her that I fall asleep for hours during the day when my heart has reached its energy limits or retort under my breath 'walking a mile in shoes'. And I do support my family through all the taxes I've paid in over my lifetime. I sincerely appreciate my disability but it is not a gift, I paid for it over thirty years. The way people look at you sometimes when one is on disability is enough to give self esteem a black eye. Moreover all those daily pills and medications that kept me alive also went a long way towards killing my spirit. Jumping for joy and crying out in ecstasy was difficult when my heart was beating only once every one and one half seconds, slowed by beta-blockers and angiotensin II receptor antagonist drugs. Pain is real for those with CTDs like Marfan Syndrome. CTD pain is sometimes debilitating beyond imagination. Fear of not knowing what the answer to the body's woes is also immobilizing. Happiness is hard to find when CTD hurt is strong. Smiles fade to frowns and laughter to moans when pain and fear induced depression sets in. Every time a new hurt would shoot through my leg, back or abdomen I'd instantly travel back to the moment my ascending aorta dissected and aneuryzed. Panic would override the beta-blocker medication effect and my heart would race out of control, ventricular tachycardia setting pulse's pace. New pains brought new fears and more darkness. I'd wonder (and still do) if my still dissected descending aorta was completely rupturing and how many seconds were left before I fell to the floor, bleeding out internally, way too quick to be driven to the ER. After so many of the same episodes and so many reruns of my life flashing before my eyes I instead began to smirk and whisper "que sera, sera" but inside I felt like crumbling. On top of the very real pain issues lie the confusion of forgetfulness my neurologist calls mild cognitive damage, a result of collateral embolistic events occurring during emergency open heart surgeries. Fear of unknown maladies was magnified as I sometimes could not accurately describe to others what was happening or even remember if I'd experienced the pain before. I have a hard time with word recall and especially with short term memory. As a writer passionate about blogging, not being able to find the right word is a crushing disability. Many times I can see the thing but cannot remember the word. As a lawyer by education, not being able to open your mouth and express what you want to say is a career killer. More good reasons to slip into the depths of a fathomless dark void of despair. Getting used to drooling, stuttering and speech difficulties was not an encouraging exercise in joyful life anticipation either. I tried to hide my sadness. Hope prevailed for a while, until my spirit could not find the energy to animate another upbeat moment. Hope then became just another unfulfilled expectation. The time had come where I was finally tired of pretending I was not depressed. So I thought I'd write a post article on the topic and possibly I find help there. Maybe I'd gain insight. Perhaps someone else out there would have an answer. First action I took was to message some of my friends and acquaintances who I knew were confronting chronic debilitating and even potentially terminal illnesses, asking them how they dealt with depression. Question One: Why do you think connective tissue disorders (CTDs) are so prone to having depression associated with them? Is this a physiological, chemical or emotional issue? Question Two: How do you think depression and fear play off each other in people with CTDs? and Question Three: Any other thoughts on Marfan, CTDs and depression/fear? Expecting many thoughtful answers to my question, as I had received many times before on other inquiries, I ended up receiving only a couple of replies. I felt shunned and even more depressed. Probably those who I asked to share how they dealt with depression had a similar response as I had and wanted to distance themselves from a depression discussion. Seriously, who wants to talk or read about depression? I hid mine for quite some time by appearing to be so upbeat. But the silence was disheartening. My perceived expectations were once again shattered and I sunk even lower in spirit, feeling like I didn't want to write again. Totally out of character with my past, I even put my beloved camera away on the computer desk. Then, over the next month a couple things happened that began to help my understanding of my blue disposition. First, I started to receive feedback from those I'd solicited about fear and depression. Their replies alone provided me with a spark of enthusiasm. The initial reply came from Pamela L. Evans-Schink MA, LMFT, CCDVC, a Marriage and Family Therapist turned homeschooling mother of two boys. Pamela practiced psychotherapy in Connecticut and New York for ten years before moving to California with her family. Both Pamela and her two sons are affected by Marfan Syndrome. Question One. Why do you think connective tissue disorders are so prone to having depression associated with them? Is this a physiological, chemical or emotional issue? Answer: I think People with Marfan Syndrome or another Connective Tissue Disorder are frequently in a great deal of pain. Living with constant pain is both physically and emotionally exhausting. Commonplace activities become insurmountable. Favorite activities are given up. There is a great deal of loss and mourning of the individual's previous life. Often times, people in the affected person's circle don't understand the pain and exhaustion because it is not visible and they have not experienced it themselves. Sadly, this can sometimes include doctors and psychotherapists. I think it is especially unfortunate when a doctor or psychotherapist thinks that treating the depression will eliminate the pain. If the depression is a result of chronic, physical pain, then the providers are essentially chasing a ghost if they do not understand both the psychology and physiology of someone with chronic pain and illness. This lack of support can lead to a feelings of isolation and failure in patients, which would contribute to depression. Question Two. How do you think depression and fear play off each other in people with CTDs? Answer: With Marfan Syndrome, the depression might also be accompanied by fear. Because of the serious cardiac risks involved with this syndrome, people might fear for their lives. People might wonder how long they have to live or if they will survive Cardiac Surgery. Surgeries can be terrifying. And for some, there seems to be no end to surgeries as various organ systems become affected and require repair. Question Three. Any other thoughts on Marfan, CTDs and depression/fear? Answer: Another contributing factor for parents who have Marfan Syndrome or another CTD who have an affected child or children could be guilt. Patients with Marfan might become overwhelmed with the guilt of passing on the gene mutation to children. It is especially hard to watch one's children suffer. Having your child or children be affected by a complex, incurable condition is a terrifying prospect no parent should have to face. The feelings of guilt and fear for one's children could add an extra dimension to the depression of affected individuals. Depression can also be a side affect of many medications. Many Marfan patients are on a whole host of medications, including heart and narcotic pain medications. I might add that certainly some individuals might suffer from depression for other reasons as well. Depression is a common condition that affects the general population and should not be taken lightly, whatever the reason. Mrs. Evans-Schink's comments concerning fear hit home with my dread of the unknown symptoms, a worry that my pains could either be a cramped muscle or the deadly aneurysm in my descending dissected aorta. Others responded and I became somewhat encouraged. Soon I even retrieved the camera from the closet, venturing outside to photograph Judy's backyard wildflowers. Other respondents agreed depression and chronic illnesses such as connective tissue disorders and Marfan Syndrome run hand in hand. Coping mechanisms included meditation, exercises, healthy and cleansing dietary practices, fasting and prayer for depression. The second important event part my recent bout with depression occurred as I watched a patch of Black Eyed Susans in back yard turning brown and starting to look ragged and withered. At first I sneered and lashed out at God and the universe for creating complex, beautiful life only to allow way too soon dying and withering to then take away forever. Like the flower, my life had so much promise even in the recent past. But after my dissection nineteen months ago and unfulfilled expectations manifesting themselves with the chronic pain of connective tissue issues, my thoughts became more despair based. Sometime after I tried to start writing again, through a variety of conversations and interactions with college friends, family, those friends in social support groups and others, a thread of answers about my depression questions began to coalesce. My friend from college, Bob suggested that God is actually here and that God's voice can be heard in nature, as in the sounds of a flowing creek. A couple days later on a hike out through Princess Place Preserve a strong, gentle wind came up from behind me, surrounded me and I really did feel the hand of God rubbing my neck and back, holding me with love. I wanted immense amounts of love and if God really was love then maybe I'd found a source. I started doing more with my teens, playing handball with Ruairi despite the pain, going fishing with the kids, continued calling my Mom and Dad every night to tell them I love them and spending time with my father-in-law over coffee. Judy and I would drive to Malacompra and listen to the Atlantic waves crash over the weathered coquina stone. Another of my college roommates reached out with kindness. Those wonderful friends in the Marfan support groups across the world too were there any time help was needed. For the brief while my Facebook account was closed during my depths of blueness, they reached out in love to my wife to express their love and concern for me. And my wife Judy was always there, allowing me space and offering unconditional love as she always has and always will. Maybe, through no one's fault but my own, I'd been missing out. Perhaps all my unfulfilled expectations could be satisfied here and now. I started thinking that maybe I was looking for something in the future that was already here and all around me. Two things began to stand out. The first was the idea that finally reaching some destination was not the deciding factor for achieving happiness and avoiding depression. Rather the key was appreciating good things in the journey we take through life here and now. One of my mantras quickly became "focus on the journey not the destination". This was critical to turning my blues around. I'd been in a "I don't have" and expectation mode most of my life. Now I've ditched expectations and instead am in the thankfulness mode. When expectations and anticipations failed to materialize, depression overtook me. But when I ditched the expectation mode and started appreciating the here and now my attitude began to change. I did not have to wait for Heaven or God. The good (sometimes super duper good) was here now too, woven in with the bad (yep, sometimes really bad). Instead of stuck in the bad waiting for the good to come I finally saw that the good is already here. The dried, withered and brown petals of the dying Black Eyed Susans held hundreds if not thousands of seeds for future life. Before I saw only a loss of youth and beauty in the late summer wildflowers. Wildflowers bloom, set seed and die. This is life. Now I see magnificent complexity and beauty in the brown and dry and in all the seasons of life. Same way with the broken stem flower and the torn wing butterfly searching out for remaining nectar traces. Heaven and happiness is here right now and we don't have to wait, we just need to see the good. Sure there is the chronic pain and many daily disappointments, but no longer do I need to wait on unfulfilled expectations. I am surrounded with such wonderful friends, family and an amazing world. Learning to love the journey really has been an experience that has freed my soul. No longer am I chained to a constant disappointment from missed or unfulfilled expectations. Focusing on the beauty of the here and now, even if there is collateral pain and suffering, has freed me. For me Heaven and God are here now. And this is different than the 'claim health and wealth' mentality that I flee from. For I now recognize that the pain and despair are real and here and not going away just because I invoke a supernatural name or phrase. But I can handle the bad because unlike the 'claim health and wealth' mentality, I now don't have to wait for the good. All I need already surrounds me. The love of friends, family and even strangers is the ultimate fulfillment of any anticipation. A life of happiness was always here. I just did not see it. Instead I saw dark depression. Now I seek out love. But I think I am lucky. I think I may have a severe case of situational depression brought on by my chronic pain and living on death's doorstep each heartbeat, moment, hour and day. Others may have imbalances in their body's biochemistry that require much more serious medical intervention. Don't get me wrong. I did not solve my depression issues with the grasping of some Aristotelian logic surrounding the concepts of love and being here and now. I still sink into fear and despair when a new throbbing pain surges through my body and I wonder if the time has arrived. I still find myself down in the dumps when thinking of giving up Scuba and other life activities. Sometimes I lie awake at night for hours listening to my mechanical heart valve tick in time and rhythm to some obnoxious song stuck in my mind. But great love overcomes all else. And there are still way too many unanswered questions I have about what is happening to my body. For instance, my right foot has grown two sizes in the last year while my left foot has shrunk a size or so, presumably due to my dissected descending aorta. My cardiologist didn't have a clue and neither do others I've asked. Yet while the fear of the unknown remains and causes me grief on a daily basis, I don't waste my time looking for hope or fulfillment of my old expectations anymore. I've found Heaven now, today, here on earth manifested in the love of my wife, my family and my friends. This love is Heaven. This love is here and now. This love is the fulfillment of all my expectations. So like the Black Eyed Susans, the wilting and withering are real and not going away. Neither is the chronic pain those with connective tissue disorders have. But whereas pretending only went so far before and the answers to my gloom did not lie in distractions, expectations, faith or hope, I now know where to look. I think the answers to my questions about beating my depression lie in the indescribably magnificent love of those individuals touching my life yesterday, today and forever.